Amaravati, Nov 29 (IANS) At least eight fishermen from Andhra Pradesh were among 22 Indian fishermen apprehended by Pakistan Marine Security Agency off Gujarat coast on Thursday, officials said. The fishermen were detained near the International Maritime Boundary Line in the Arabian Sea on charges of entering Pakistan's territorial waters. The fishermen from Srikakulam and Vizianagarm districts of north coastal Andhra had migrated to Gujarat and they were among a group of 22 who had ventured into the sea on three boats. The fishermen were reportedly taken to Karachi. 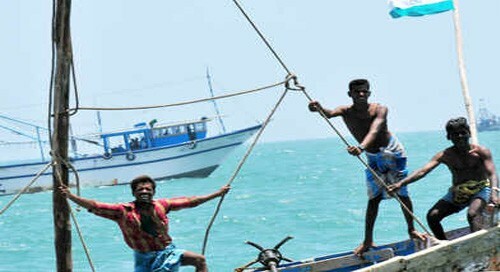 Andhra Pradesh's resident commissioner in New Delhi, Arja Srikanth, through officials in foreign ministry contacted the Indian High Commission in Pakistan to seek the help for the fishermen's release. The officials in Indian High Commission have contacted Pakistan officials. Every year, fishermen from coastal Andhra go to Gujarat in September and return in March. The families of fishermen apprehended by Pakistan were worried over their safety. They appealed to the state government to take steps to ensure their immediate return.